There’s a room at our school called “The Teacher Work Room”. It’s funny we call it that because I’ve never seen any teacher work in there. It’s like previous schools calling a room “The Teachers’ Lounge”. No lounging happened. 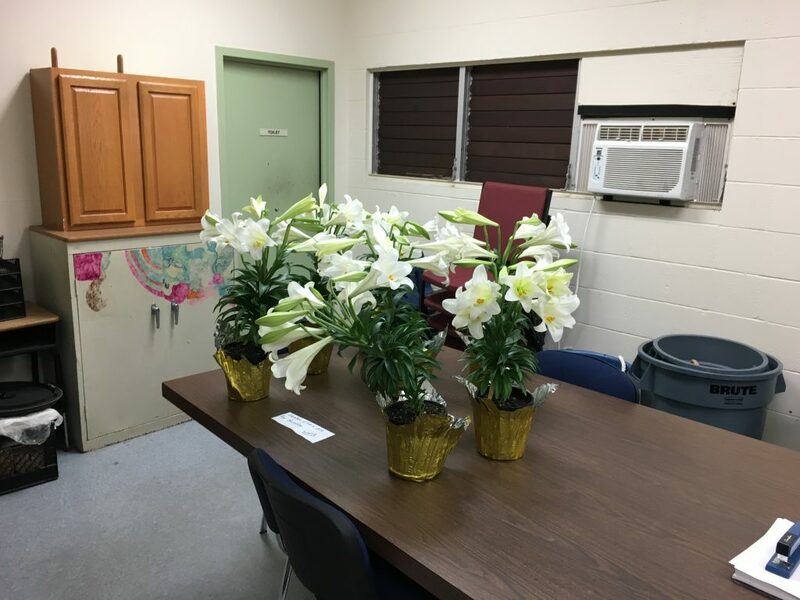 Easter lilies! Yay! Because of my move, Holy Week has been and will be so busy this year. I’m sad because I like Holy Week so much. Hopefully I’ll be able to enjoy Maundy Thursday and Good Friday services in between moving all my stuff and cleaning my apartment. By Easter Sunday, the moving and cleaning will be done. I’ll definitely be enjoying that! Today is the official move-in day, yes? Congratulations! In…… four days this will all be done! I laugh about a teacher ‘lounge’/workroom, too. We have a ‘resource room’, but everybody works in their classrooms and the teachers who get to take a break just leave the building.